The 46th season of the Oregon Sinfonietta offers the following opportunities to experience the orchestra’s lively performances with outstanding soloists under the baton of Dr. Donald L. Appert. 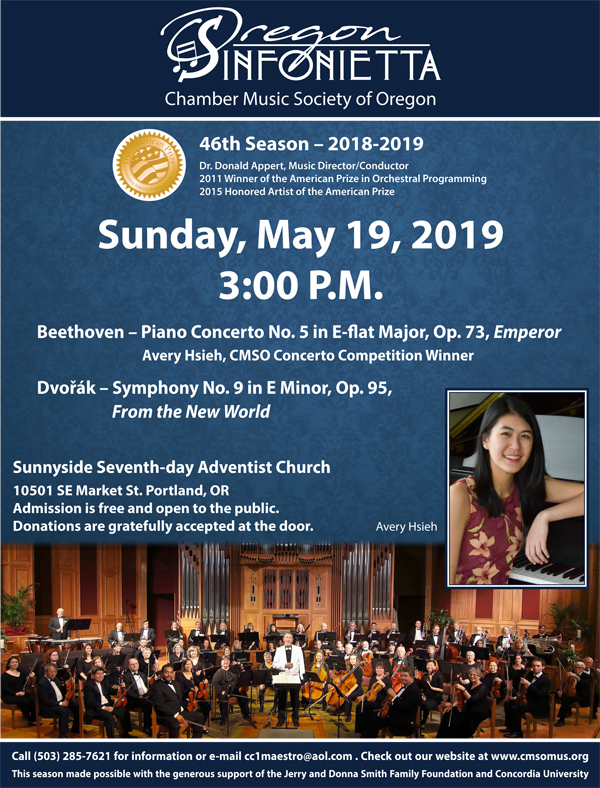 The concerts are free and open to the public, and will take place at the Sunnyside Seventh-day Adventist Church, 10501 SE Market Street, Portland, Oregon. Laura Beckel Thoreson, mezzo-soprano Please click here for Ms. Thoreson's musical biography. Esther Kwak, CMSO Concerto Competition winner Please click here for Ms. Kwak's biography. Ethel Smyth – Serenade in D Major Please click here for a biographical article about Ms. Smyth. Eugene Howe, CMSO Concerto Competition winner Please click here for Mr. Howe's biography. Avery Hsieh, CMSO Concerto Competition winner Please click here for Ms. Hsieh's biography. Dvořák – Symphony No. 9 in E minor, Op. 95, B. 178, "From the New World"